Just as knowledge is accumulative, gathered over the centuries, so too is spiritual grace and wisdom. And like knowledge, spiritual grace is a human treasure passed down from generation to generation, augmented by ever growing numbers of Enlightened-beings. An order, a community of mystics, both male and female, transmitting to each new generation the accumulative blessing of its saints, is what is meant when we speak of "lineage". The Kagyu Order is chiefly a spiritual lineage. It is also a school of spiritual instruction and meditation practice. Since the Kagyu Order is especially known for its emphasis on disciplined meditation practice, we are particularly called the "practice lineage". The Kagyu "practice lineage" has been handed down from master to disciple for hundreds of years. Our Order is particularly famous for the intimate allegiance that exists in the master-disciple relationship. This emphasis is reflected in the very name "Kagyu" since the word "Ka" refers to the oral instruction of the Lama, and "gyu" means lineage. The Kagyu Order is a school that guides seekers on the spiritual path through an interplay of direct questioning and answer, pointing out the true nature, through the course of meditation, and this occurs during an intimate form of oral instruction between teacher and student. Thus it is said that our Yoga System is one where, through deep meditation (dhyana) alone, the ultimate goal can be achieved in a single lifetime. Our approach is thus that of the historical Buddha, who attained Great Enlightenment while in meditation so many years ago. It is now a long time ago that the dusty sesame fields of eastern Bengal were blessed by the living presence of the extraordinary saint Tilopa, and yet the wisdom of his teachings lingers like a subtle perfume throughout the Himalayan hill-kingdoms to this day. Tilopa is described as a siddha, a yogi-saint who, having attained personal enlightenment and spiritual Liberation was able to reveal his realization through an exceptional display of miraculous activity. Tilopa was one of those peripatetic saints who wonder the Himalayan wilderness, without possessions, without attachment, totally god-intoxicated—a Tantric saint, but also a master of mystic powers (siddhi) quite extraordinary. What makes Tilopa special is in part the fact that he gathered together and preserved what was an almost lost collection of secret esoteric instructions concerning the higher practices of Tantric Yoga. These he transmitted to a small circle of Initiates, and it is from them that these instructions have come down to us, today. Without his having done this, and without his main disciple Naropa carrying on the tradition, these advanced spiritual technologies, discovered by the Yogi fraternity of India long ago, would now be lost to the world. Having collected and combined the essential wisdom-teachings of archaic ages, and demonstrated their power to spiritually transform human nature through the example of his own life, Tilopa became the master-founder of our Kagyu spiritual tradition. Tilopa was noted for teaching in a highly symbolic manner. Once, for example, when Naropa approached him, prostrated with folded hands, made a mandala-offering, and asked, "Guru, kindly give me instruction," the master responded by showing him thirteen symbols over a period of thirteen days. Tilopa explained, "In order to receive instruction it is necessary first to have the appropriate empowerments." Thus, for the first symbol, he spread some cloth on the ground and, using a hot coal, let it burn. What was left after the cloth had been burned away was the inprint of the warp and woof retained in the ashes. For the second symbol, Tilopa merely held up a transparent quartz crystal. For the third symbol he asked Naropa to untangle a twisted ball of thread. Naropa went to work on the ball for some time. However, after Naropa had succeeded in unloosening a portion of the tangle, Tilopa simply threw the whole thing away and left. And so it went on until all thirteen symbols had been demonstrated. The special teachings that Tilopa transmitted through verbal instruction are known as the Four Oral Injunctions (bKa-babs-bzhi).1 Each Injunction represents a special line of esoteric instruction. Although there is some discrepancy in the historical record regarding the identity of the masters who were holders of these four teachings, the most common consensus amongst modern scholars is that the four Oral Injunctions transmitted by Tilopa consisted of the following: (1) from the Master Vijaya came the secret methods of raising psychic-energy (gTum-mo, otherwise known as Kundalini); (2) from the line of Nagarjunapada came the instruction concerning the maturation of a psychic-body (sGyu-lus) and maybe also, from the same source, instruction on Dream-yoga; (3) from the line of Lawapa or Luipa came the yoga of Clear Light ("Od-gsal); (4) and from the noble yogini Subhagini, came the secret practice of male-female Union (Las-kyi phyag-rgya). Although, in historical terms, there are discrepancies between various accounts and therefore some difference of opinion on what and how the four Oral Injunctions were taught in ancient times, nevertheless we know that it was a combined or unified body of the ancient teachings which Tilopa transmitted to his disciple Naropa. Naropa, head professor of a great University in the heart of India, was initially a learned philosopher, a great religious scholar, and an exemplary Buddhist monk. But his life was transported into a new dimension, turning him from a sober intellectual to an ecstatic mystic, a Yogi, after meeting the crazy-wisdom saint Tilopa. In his fervent desire to follow the Master to the ends of the earths if need be, Naropa abandoned his academic career, let go of scholastic fame and the security of his social position, to wander for twelve long years through India as an itinerant holy-man. If one were to ask what is the proper name of collective teachings of the Kagyu, the fundamental praxis of the Lamas of this school, or in other words the unique Kagyu way of realization, the answer would be Mahamudra (Tib: phyag-chen), the meditation-path of the Great Seal. This is integral with the method of the Six Doctrines or the Four Injunctions. Mahamudra is the union of all the systems, the method that leads to direct seeing into the nature of the mind. Marpa (1010-1113 AD) was a landowning family man and a Tibetan merchant. After raising funds from the sale of property, Marpa made the difficult journey over the rugged Himalayas to India in search of spiritual understanding. His search led him to Naropa. By this time the blessed Naropa was an elderly, highly revered and famous siddha, who's remarkable radiance drew to him vast numbers of disciples eager to absorb something of his grace-filled wisdom and goodness. It is thanks to Marpa's courageous diligence that the hard-won esoteric teachings of Naropa's lineage were brought back to Tibet. One of Marpa's leading disciples was the white robed Yogi-Saint Milarepa (1038-1122 AD), whose ascetic life of meditation and hauntingly beautiful songs have inspired generations of spiritual seekers ever since. Milarepa started on the spiritual path in an effort to please his mother who, having suffered abuse after her husband's death from competitive family members, wished her son to learn "black magic", so as to reek revenge. 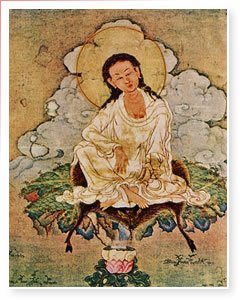 It is said that through the agency of sorcery, Milarepa succeeded in killing many of his mother's persecutors, but that afterwards he suffered bitter emotional remorse for his actions. This drove him to seek a spiritual teacher. Milarepa initially suffered under the hard discipline that Marpa imposed upon him, both to cleanse him of residual guilt from the bad acts of his youthful indulgence in sorcery, and as a means of breaking his pride and laziness. Part of this discipline, which Marpa inflicted on Milarepa, consisted of building a strong fortress tower, allowing Marpa's retainers to dominate the local valley where he lived. It was this resulting economic and feudal dominance by Marpa's encampment that allowed the Kagyu school to become well established in Tibet. Without this strong material base, the Kagyu never would have succeeded for long, and may well have vanished from the Tibetan scene in a generation or two. After loyally completing the great trials and hardships that Marpa imposed upon his disciple, Milarepa received initiation and empowerment into the Cakrasamvara-tantra and instruction on the technique of awakening gTum-mo (kundalini). Milarepa's great disillusionment with the world came on the death of his mother. Finding the bones of his mother laying in the ruins of the family home, the loneliness and pain of human existence caused him to make a solemn vow that he would abandon everything so as to meditate in remote mountain caves, until such time as he might win through to true Enlightenment. He then took up an itinerant yogi's life, wandering without possessions of any kind, from one end of the Himalayas to the other. Living in the wilderness for twelve consecutive years, he practiced his Master's instructions, until the day when, after immense striving, he finally gained realization. Milarepa acquired fame as Tibet's Greatest Yogi. As his fame spread far and wide, vast numbers of disciples flocked to him. He gave his teachings and meditation instruction freely and without cost, to all who came and showed they had an aptitude for the hard spiritual path. Over time, there formed around him an illustrious company of white robed yogis, yoginis, along with many red robed monks and nuns, all great meditators, great seekers of holy unsurpassable Enlightenment. This was the extreme high point in the glorious flowering of Tibetan spirituality. Milarepa's two leading disciples were (1) the renowned yogi Rechung Dorje Tagpa (1083-1160) who did not involve himself in creating an organization, and (2) the great Tibetan medical doctor and monk Dagpo Lha-je Gampopa (1079-1173). The latter united Tilopa's esoteric teachings, the Way of the Yogin, with the orthodox Kadampa3 tradition of classical monastic Buddhism, to form what has become the glorious Dagpo Kagyu Order of Tibet, existing to the present day. Thereby he succeeded in preserving the inner wisdom-teachings by creating a viable outer organization to practice and transmit them from one generation to the next. In Gampopa's lineage, there are three ways of teaching the path of Mahamudra. These three approaches are known as: (1) the Sutra Mahamudra tradition (Tib: mDo-lugs), (2) the Tantric Mahamudra tradition (Tib: sNgags lugs), and (3) the Essential Mahamudra tradition (Tib: sNying-po lugs). These three traditions of Mahamudra are preserved to this day in the Kagyu school. All aspects of the Tantra and Mahamudra teachings of the Kagyu are founded on a direct understanding and realization of the nature of the mind, both in its everyday nature (Tib: thamal gyi shespa, ordinary consciousness) and its essential reality (Tib: sems kyi rdo-rje, vajra-mind). Gampopa was especially famous as an exemplar of the Sutra tradition of Mahamudra meditation, which is a very direct, clear and basic approach to rapid awakening. Rechungpa passed his lineage to Geshe Khyung Tsangpa (1115-1172) who in turn passed it on to the yogini Machik Onjo. Traces of Rechungpa's lineage continue within the existing Kagyu schools to the present time. Rechungpa's teaching focused more on the Tantric methods of Mahamudra; especially the dynamic path of raising what today is commonly known as Kundalini (the Buddhist term is Candali) and the mysticism of male-female Union. While Gampopa was a monk and therefore developed the monastic aspect of the Kagyu tradition, Rechungpa continued the tradition of the white-robed Yogins. Rechungpa's line of instruction, with time, became infused and blended with the Shamarpa's lineage in the Kagyu school, and is maintained to the present time. 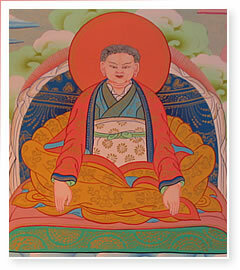 Karma Kagyu was founded by Karmapa Du-sum Khyenpa (1110-1193). Tshalpa Kagyu was founded by Zhang Yudrakpa (1123-1193). Ba-rom Kagyu was founded by Ba-rom Dharma Wangchuk. Phagdru Kagyu was founded by Phagmo Drupa Dorje Gyalpo (1110-1170). Gampopa's leading disciple was the glorious Karmapa and to this day the Karma-Kagyu branch tends to represent the dominant or main lineage of the Kagyupa. Taklung Kagyu founded by Thangpa Tashi Pal (1142-1210). Sri Drukpa Kagyu founded by Ling Re-pa Pema Dorje (1128-1189). Yamzang Kagyu founded by Yamzang Choje (1168-1233). Shugseb Kagyu founded by Gyergom (b. 1144). It is possible to distinguish several transmissions within each named lineage of the Kagyu. However, all these lineages pass along what is essentially the same instruction descending from Dagpo Lha-je Gampopa, and are therefore all considered sub-schools of the one unique Dagpo Kagyu family. Since these are all branches from a common tree, they remain in close harmony with each other. The first Karmapa, Du-sum Khyen-pa, was born in a humble village in Eastern Tibet in the year 1110 AD. His father and mother were devout practicing Buddhists and as a child he was raised in a deeply religious environment. At the age of sixteen he was sent by his parents to receive a classical monastic education. Consequently at the age of nineteen he became the student of a famous scholar named Geshe Gya Marwa, from whom he studied the five sacred treatises of Master Maitreyanatha and other learned philosophical works. In the presence of Khenpo Mal Duldzin, at the age of twenty, Du-sum Khyen-pa received full ordination as a Buddhist monk. From that moment on he set himself to perfect the stream of his consciousness through careful adherence to the monastic rules of the Vinaya. The Karmapa's education and training was extensive. At the age of thirty, Du-sum Khyen-pa sought an audience with the venerated Master Gampopa, before whom he begged to be admitted as a disciple. Moved by the obvious sincerity of Du-sum Khyen-pa's heartfelt plea for spiritual instruction, Je Gampopa bestowed the fourfold sacred empowerment of Sri Hevajra and Dakini. 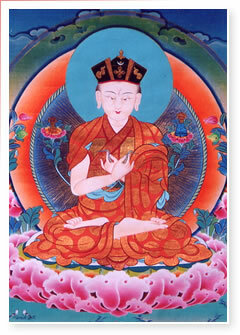 After bestowing initiation and empowerment, he then imparted the Six Doctrines of Naropa in respective order. Four years later – four years spent in solitary meditation practice – Du-sum Khyen-pa realized the innate clear luminosity and absolute nature of the mind. His heart became a font overflowing with bliss, and an immeasurable love towards all beings was born in his soul. Thus did he attain complete Enlightenment. The first Lord Karmapa, Du-sum Khyen-pa, became the most famous saint, miracle-worker and revered spiritual Lama of his age. Thousands were touched by his gentle counsel or helped due to his caring attention. He is pictured in paintings as an elderly, gentle white haired man, possessed not only of vast understanding, insight and wisdom, but also of a most tender compassion for others. He received the characteristic name "Karmapa" from the renowned Kashmiri scholar Sakyasri, who declared him to be the "one who performs the 'activity' (karma) of all the Buddhas" prophesized in the Samadhiraja-sutra. Karmapa Du-sum Khyenpa came to be looked upon as the incarnation of the Bodhisattva Avalokitesvara, the Compassionate One. The major monastery that he founded at Tsurphu in Tolung, not far from Lhasa, was to become the main seat of the Karma (or Kamtsang) Kagyu school. Some time before his death the Karmapa made several prophetic predictions; in particular he promised to return again and again in this suffering world, performing the supreme sacrifice of an Enlightened Master by consciously taking birth in the flesh, so as to dedicate himself to the salvation of others. So saying, he passed the full lineage of his transmission to Sanjay Rechen. He died in 1183 A.D. Subsequently Sanjay Rechen passed the lineage to his student Pomdrakpa, and he in turn transmitted the custodianship to Karma Pakshi (1201-1283), whom he recognized as the clearly prophesized reincarnation of Du-sum Khyen-pa. After the renowned Master Padmasambhava, the most famous miracle worker in Tibetan history was the indomitable saint Karma Pakshi. He first received monk's ordination and teachings from the Nyingma master Kathok Jampa Bum in eastern Tibet, and then travelled to Tsurphu where he met with his chosen master Pomdrakpa. Already in 1221 a Karma-Kagyu Lama by the name of Tsangpa Tung-khur-wa, while visiting Minyak, had impressed the powerful Mongol ruler Genghiz Khan with the degree of his asceticism and sanctity. In 1251 Karma Pakshi received the first of several invitations from Kublai, Genghiz Khan's princely grandson, to visit the imperial city in China. The Karmapa impressed the young prince Kublai and through a display of supernatural power succeeded in winning the Emperor Mongke from Christianity over to Buddhism. The Emperor is said to have demanded from the Christian missionaries, who had been sent to him by the Pope, the performance of a miracle as proof of the superiority of the Christian religion. The Christians, unable to affect such a miracle on demand, declined. 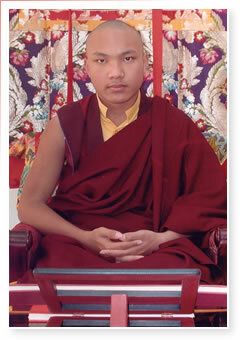 The Karmapa, in the presence of the missionaries themselves, then caused the Emperor's wine cup to rise supernaturally to his hand, whereat Mongke adopted Buddhism, while the discomfited missionaries declared the levitation to be the work of the devil, into whose hands they now believed the Emperor to have fallen. The Emperor's conversion projected Karma Pakshi onto the world stage and into a position of popular acclaim at the royal court, which being of a humble and religious character, he did not enjoy. When Mongke Khan died in 1260 and Kublai took power against his younger brother Ariboga, the Karmapa's preference for the contemplative life over that of the court (Kublai had ordered Karma Pakshi to stay at his side, and the latter had refused) earned him disfavor and eventual persecution. In his stead a learned monk named Sakya Pandita (1182-1251), the head of the Sakyapa school, much encouraged by his ambitious nephew Phagpa (1235-1280), made a bid for Kublai's royal patronage. Once that Sakya Pandita convinced Kublai of his usefulness, the Khan's army, under General Dorta, marched into Tibet, destroying monasteries and killing large numbers of Kagyu monks, granting the Sakya school theocratic rule over the country, in return for Tibet becoming a subject "nation" of the Mongolian Empire. Both the monasteries of Reting and Drikung were burned, although these later came to be rebuilt. Karma Pakshi died at Tsurphu in 1283. The religious life of the Karma-Kagyu, however, continued to flourish. 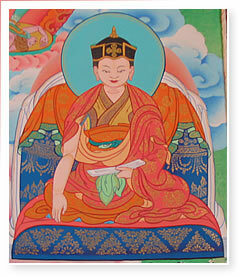 After the death of Karma Pakshi, he was succeeded by his disciple Urgyenpa (1230-1312). He left with Urgyenpa a letter or last testament, describing the details of his next rebirth. Thus, after Urgyenpa, the lineage came to be held by a person considered to be a reincarnation of the Karmapa, namely Rangjung Dorje. 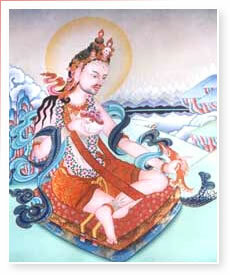 From the Siddha Urgyenpa, Rangjung Dorje received the empowerments of Hevajra, Chakrasamvara, Kalacakra and Vajrakilaya. 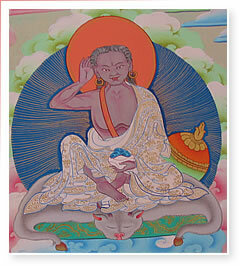 Lama Nyen-ras imparted to him the Six Doctrines of Naropa, along with instruction on Mahamudra. He became extra-ordinarily proficient in the doctrines and insights of Dzog-chen, and from Rigdzin Kumara-raja received the "Heart Essence" (Nying-t'ig) lineage of Vimalamitra. To perfect all these teachings through direct experience he resided for many years in the isolated hermitage of Pema Chung-Tsong above Tsurphu. He also founded a large new hermitage called Dechen Yangtse, with many caves for meditation, on a mountain range behind Tsurphu. Karmapa Rangjung Dorje paid a visit to the Imperial Court in 1331, on the invitation of the Khan Togh Temur, who however died before seeing him. Rangjung Dorje consequently assisted in the selection and enthronement of the new Emperor. In 1334 he left for his beloved Tibet, but was pressured into returning to China in 1338, where he died after a brief period of public teaching. Karmapa Rangjung Dorje's leading disciple was the first Shamarpa, or Red Crown Lama of Tibet. Shamar Drakpa Senge (1283-1350) came from eastern Tibetan. The first to recognize the unique powers and psychic abilities possessed by the young Drakpa Senge was a Lama named Lodro Drakpa. Then at the age of seventeen he became a disciple of the Karmapa and began a program of extensive meditation at Tsurphu monastery. At the age of twenty-four he began the practice of the Six Doctrines and quickly demonstrated great aptitude. For the next two years he lived in isolation, developing his spiritual practice. At the end of that period he received a vision of the Karmapa, in which he was told to found a particular monastery at Nenang. This he did and the buildings were rapidly completed by the collective labour of twenty-five disciples. Once he had imparted to those disciples the basic instruction they needed to begin meditation, Drakpa Senge again went back to his cave in the mountains, where he spent the remainder of his life in meditation. The fourth Karmapa Rolpe Dorje became teacher at the Imperial Court in 1359 and stayed in China until 1363. But he found the Yuan dynasty in a state of decadence and about to collapse. He was therefore happy to leave the Court as soon as he could politely do so, nor did he return when so "ordered' by the new Ming Emperor Tai Tsung in 1368. In 1350 a child was born at Chemo Lung in northern Tibet who, at the age of fourteen months declared himself to be the reincarnation of Drakpa Senge and his teacher to be the Karmapa. He did not actually meet Karmapa Rolpe Dorje until seven years later, but when he did so, the latter is said to have immediately recognized him as his disciple. The bond between master and disciple became like that of father and son. Thus a continuing line of incarnations, the Karmapa as father on one hand, and the Shamar as son on the other, has descended down through the ages. Other disciples of later Karmapas likewise have formed similar lifetime after lifetime ties with His Holiness. 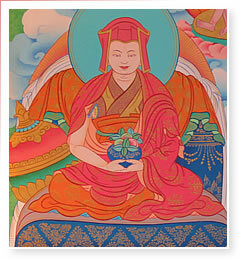 The fifth Karmapa was named De-zhin Shegpa. Both the Karmapa and his leading disciple Cho-kyi Gyaltsen became spiritual teachers of the Chinese Emperor Tai Ming Chen. Highly pleased with the Karmapa's disciple, Emperor conferred the title "Tai Situ' on the latter, and this began the famous Tai Situ line. Although he received high honours and distinction at the Chinese court, Tai Situ Cho-kyi Gyaltsen nevertheless spent most of his life meditating in solitary caves. The seventh through to the tenth Karmapas lived during periods of constant political struggle in Tibet. First, the Emperor Yin Tsung was violently antagonistic toward Buddhism, then his successor was as fervently pro-Buddhist. The changing policies of the Chinese Empire flowed over into independent Tibet, causing social upheaval, and opening the door for ambitious religious leaders to build temporal power bases. This led to a lot of troubles for the Karmapas, who as truly religious leaders, wished not to be drawn into the conflicts of mundane politics. When the Emperor Wu Tsung sent a mission to the young eighth Karmapa Mikyo Dorje, the mission was attacked enroute by a band of one hundred armed monks loyal to the second Dalai Lama, Ge-dun Gyam-tso. Mikyo Dorje had to be quickly whisked away from his seat in Kham and taken to Central Tibet under armed bodyguard, for fear of assassination. Mikyo Dorje's position as a spiritual leader remained under constant attack throughout his life. The Shamar Lama was likewise harassed and hunted by the growing Gelugpa monastic hierarchy. Consequently the fifth Shamarpa, Konchok Yenlak, had to seek protection from Tsang De-sri and the powerful Drikung hierarchs, in an effort to thwart the ambition of Ganden's princes. The powerful warlord Arslan Khan invaded Tibet in 1635 and in the conflict that ensued, the noble Shamarpa was slain. Monasteries were burned, villages destroyed, and many lives lost. The Karmapa had to flee from Tsurphu and during extended travels visited Bhutan, where he engaged himself mainly in deep meditation. He also spent nine months in Tsari, meditating on the cycle of Cakrasamvara, and in Sikhim where he founded Rumtek monastery, which today has become his main seat in exile. Dying in 1603, his reincarnation was discovered in the extreme north-east of Tibet and raised by the sixth Shamar Tulku Cho-kyi Wangchuk. The Karmapas have not only played a role as custodians of the Kagyu practice tradition. They have also had a profound and lasting influence on the whole of Tibetan Buddhism. For example, the third Karmapa Rangjung Dorje played a key role in the preservation of the lineage of the Nyingma school. The fourth Karmapa Rolpe Dorje recognized the potential of the young Tsongkhapa, and becoming the first teacher of Je Tsongkhapa, was instrumental in the founding of the Gelugpa school, which today is famous for being the school to which His Holiness the Dalai Lama belongs. The seventh Karmapa through to the ninth were great exponents of Mahamudra. The eighth, Mikyo Dorje (1507-1554), was renowned for his scholastic works on Sutra and Tantra. The tenth was a great artist and poet. The fourteenth Karmapa took part in preserving the Shangpa meditation lineage and especially promoted non-sectarianism throughout Tibet. 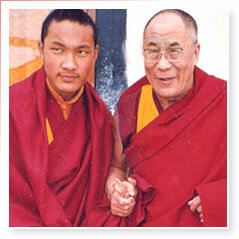 The fifteenth Karmapa Khakyap Dorje supported the Terma tradition of the Nyingma school. The great sixteenth, Rangjung Rigpai Dorje, was one of the most remarkable Buddhist masters of our own time. In this manner the succession of Karmapa's has continued and the lineage remains strong to this day. The present Gyalwa Karmapa is in his seventeenth incarnation and presently resides in close proximity to His Holiness the Dalai Lama, near Dharamsala in northern India. He is the present day custodian of Tilopa's esoteric mystical tradition, the Way of the great Yogins of the Himalayas, and the supreme spiritual head of the Kagyu Order. His Holiness the Seventeenth Gyalwang Karmapa, Ogyen Trinley Dorje, is the leading Tibetan master in the post-1959 era of Tibetan history. His Holiness is the first reincarnate Lama in world history to be recognized by a communist government. After being enthroned at Tsurphu, His Holiness contributed mightily to the revival of Buddhism in Tibet in the 1990's. During this time, His Holiness rebuilt and fully developed the Tsurphu Monastery, the main seat of the Karmapas that was completely destroyed during 1959 and the '60's Cultural Revolution. He was eventually forced to leave Tsurphu at the end of 1999, and he fled to India. His Holiness is now temporarily living in Gyuto Monastery in the Dharamsala region, where he is receiving full lineage transmissions from a number of teachers and benefiting countless sentient beings. Thousands of Tibetans, Indian, Nepalese, Bhutanese, Asians, and Westerners visit His Holiness year round. His Holiness grants public and private audiences as well as special practice interviews for higher lamas. The worldwide Karma-Kagyu Order of Tibetan Buddhism is today under the spiritual administration of the Karmapa's five heart-sons, with their respective branch monasteries and organizations.4 Largely in India, but also all over the world, Kagyu Lamas under the guidance of His Holiness are engaged in disseminating the wisdom of the lineage. 1 Hence the full name of the school. "Kagyu" (bka-brgyud) is short for "Theg-pa gsum gyi snying don bka-bab-kyi-chose bzhi gdams-ngag bar ma chad-pai brgyud-pa" which means "the unbroken intimate lineage of the profound four doctrines of oral instruction that reveal the essential truth of the Three Ways of Buddhism." The Third Karmapa, Rangjung Dorje, described the line of Indrabhuti, Kambala, Virupa and Dombi-Heruka as a western lineage – that is, a lineage of instruction from the north-west of India. The line of Saraha, Nagarjunapada, etc., he referred to as a southern lineage. The eastern lineage, he said, consisted of Sukhamahasiddhi, Thanglopa, Shinglopa, and Karmaripa. And the northern lineage consisted of the masters Luyipa, Dengipa, Darikapa, and the yogini Sukhasiddhi. Some historians, rather than list the fourth lineage as having to do with Union, instead define it as instruction on Dying and Psychic Projection. The ancient history is obscure. 2 The Six Doctrines (Skt: Satadharma-upadhesa, Tib: Chos.drug.man.ngag.sde) of Naropa consists of instruction in the secret mystical practices of (1) Chandalini-yoga, (2) Illusory-body, (3) Clear Light, (4) Dream-yoga, (5) liberation through the After-death (bardo) state, and (6) the yoga of Psychic projection (i.e., projecting the consciousness out of the body). Through achievement in these six practices one becomes a "Master" (bla.ma) in the Kagyu school. 3 Kadampa: Tibetan spelling, bKa'.gdams.pa. Chen-nga Rinchen Pal said, "Not one syllable of the Buddha's word (bKah) should be left out. All of the Buddha's precepts (gDams) should be known and understood." The school begins with an early reform movement Tibet initiated by an Indian master named Atisa. It is said that Atisa advice (gDams) to his disciples consisted of a return to the simple and original "Word' (i.e., the Tripitaka) of the Buddha. 4 The Karmapa's main seat is at Tsurphu Monastery, not far from the capital city of Lhasa in Tibet, while a second official seat is held at Rumtek Monastery, in Sikkhim, India. The official seat of the Gyalwa Karmapa in North America is located at Karma Triyana Dharmacakra, Woodstock, in the state of New York, USA.